Playing a poker tournament for the first time is a surreal experience. The intensity of games, agro-maniacs, and jumping blind levels can be too much to handle for many TAG cash game players. Passive players in particular need to adjust their game before dipping their feet in the tournament fields. In this guide, I want to clear a few commonly asked questions/qualms about playing tournaments, and help you through your first game. If you’re a cash game player playing tournaments, you will have to make some big adjustments to your overall game. Even a $200 NL shark can look like a nit at the tournaments if he doesn’t adjust properly. Poker tournaments are not really about playing solid ev+ poker. Forget everything you read up to now. Because the truth is: playing tournaments is all about chip-building and getting in the money. What’s the difference? Tournaments are very strange relative to “normal” cash games in poker, and there are several reasons why. Firstly, you only have one buy-in (unless it’s a re-buy event), so you have to make decisions with that in mind. Secondly, you don’t have “time” on your hand because the blinds and antes are always increasing in levels. Players can’t “wait” for their pocket rockets and big gun hands. You need to force yourself into pots, and often this puts more emphasis on playing your opponents rather than your hands. Lastly, poker tournaments have various “stages”. Technically, most people refer to 3 stages in any tournament – the early stage, middle stage, and late stage. In each “stage” or period, your MTT strategy needs to adjust because the environments changes. In the beginning of a tournament, you have to play tighter than the final table for example. As fewer players remain and the payoff money approaches, everyone changes their game in some way. You can go here for more information on how to play poker tournaments. What Are the Odds of Me “Busting Out” from a Tourney? Pretty big. Nah I’ll come out and tell you the truth. The odds of you busting out (losing you chips) in a tournament are virtually 100%. Unless you win a tournament and come 1st, it’s guaranteed you will have busted out of a tournament from bad play, bad luck – or in my case falling asleep at the computer monitor. You can still make alot of money busting out of a tournament however – as long as you make it to the later stages. Over time, the number of tournaments you play will begin to equalise your downswings or good/ bad luck. How Often Can I Win or Make Money in a Tournament? An exact answer would depend on a few things including your skill, the skill of your opponents, and finally the number of entrants in a tournament. If we assume we’re better than 70% of the field (which is almost always the case in Micro buy-in tournaments), you can expect to make profit for every 5 -10 tournaments you play (10-20% of games in total). Professional online MTT players such as Chris Moorman make around 50% lifetime ROI (return on investment) in their games. In summary, if you’re a good player than in the long term you will be making money. Learn more about tournament ROI and how much do players make in tournaments. How Do I Choose Online Tournaments? Poker rooms have more tournaments than players nowadays. So choosing which ones to play can be tricky. The most important part is playing tournaments with the “right” entry fee. Tournament bankroll management suggests only playing tournaments with a buy-in of 1% or less of your total online poker bankroll. If you have a $200 bankroll, you should only play $0-$2 buy-in events. This reduces the risk of you losing your entire bankroll, and lets you play enough games to make some decent final-table finishes and profit. For more information on choosing a tournament you can read this guide. Where are the Best Online Tournaments? People choose tournaments for different reasons (sort of like women). Some like them lean and mean – others like them “big n juicy”. 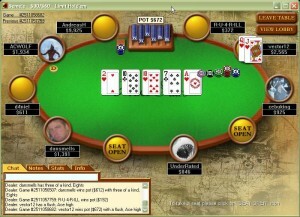 The best tournament poker site voted by many is PokerStars. Officially we recommend UltimateBet, but as a beginner we’re sure you’ll find everything you need here. To find great tournaments to match your bankroll, visit our online MTT Guide. Tournaments are a game of volume. Play over 100 games before you judge yourself and give up. I know someone at Full Tilt Poker who played 20 $2 buy-in games and didn’t cash out. Next game he won Full Tilts’s $200,000 Double Deuce event and made over $30k in a single pay-off! Also check out the MTT tools that can help you make that last step from busting out in the middle stages to breaking onto the final table. Play Where the Fishes are! Join 888 Poker! 888 Poker has one of the easiest to beat player pools. Don't join the sharks on PokerStars, play where the real fish are! How Much Do Players Make in Poker Tournaments? Click here for a list of US friendly poker sites! Grab this exclusive deal now! YES I want to play with $88 free!